Note: I have found no evidence to Mrs. McDonald or Mr. Gibson. Mary McDonald was born on November 14, 1770 in Frogtown (near Norristown). When Mary was 4 years old, her mother died. She was then sent to live with the family of Rees Howell as a bound servant. Howell had a farm situated on the road betwe...en Gulph Mills and Valley Forge. In mid December, 1777, (about a month after her 7th birthday) Mary watched as Washington's ragged Continental Army passed in front of the Howell's house on their way to nearby Valley Forge where they would make camp for the next several months. It was snowing fiercely on January 1, 1778. The Howell family was about to sit down to a New Years Day feast when their neighbor, Isaac Walker arrived outside their door on a huge sleigh. Walker told them that the soldiers at Valley Forge were starving and he had been out collecting food for them all day. The Howells were Quakers and could not participate in the war, but they would not have a feast while people nearby were going hungry. They loaded up their entire meal onto Walker's sleigh. Little Mary asked if she could go along to deliver the food. When the sleigh first arrived at the camp, the soldiers were gloomy, huddled around small fires built in the snow. Many were not wearing shoes and had bloody, frozen feet. Once they realized what was in the sleigh, their disposition changed. They cheered Walker and treated Mary like a princess. There was both laughter and tears as they unloaded the sleigh. Some of the soldiers picked Mary up and danced around with her. The soldiers invited Walker and Mary to eat with them and they accepted. George Washington arrived to speak with Walker and when the conversation was over, he smiled at Mary and patted her on the head. During the length of their encampment, twice a week soldiers would visit the farmhouses in the area looking for donations. Mary took it upon herself to ration the family's food and always made sure that there were baskets loaded with bread, flour, nuts, potatoes and meat for the soldiers to take away with them. General von Steuben arrived at Valley Forge in late February of 1778 and began to drill the troops quite rigorously. The constant sound of musket and cannon fire scared Mary and she was relieved when the Army vacated Valley Forge in the late Spring. As she grew into her teen years, Mary enjoyed long walks and horseback riding around Valley Forge. She also enjoyed quilting bees and popcorn parties. Mary remained with the Howell Family until 1788. In 1789 she married a fella named McDonald. They moved to North Penn Village (today it is 27th and Dauphin....when the McDonalds lived there it was out in the country). They had 9 children. Mary outlived all of them (and her husband). When her husband died he asked her to never remarry. She promised that she wouldn't and kept her word. 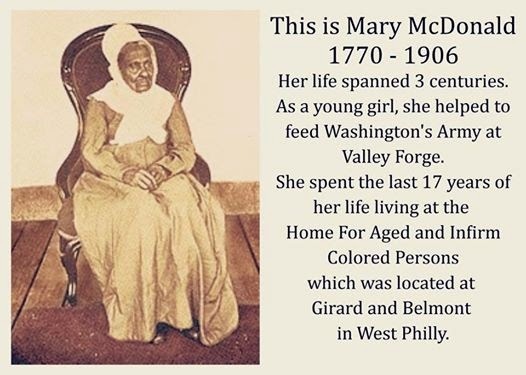 By 1887, her last child had died and on December 19, 1887 (at age 117) Mary went to live at the Home For Aged and Infirm Colored Persons which was located at Girard and Belmont in West Philadelphia. By this time she was so stooped over that she stood just 4' tall and weighed about 70 pounds. By 1894, newspapers across the country were calling Mary the oldest woman in America. What I find interesting is that at the same time, the oldest man in America also lived at the Home For Aged and Infirm Colored Persons and had become Mary's best friend. His name was John Gibson. John was born on July 11, 1774 at Church Hill, Maryland. Like Mary, John was free born but found himself bound to a white family at an early age. But whereas the Howell Family was kind to Mary, the family that John lived with treated him harshly. John ran away but headed south instead of north and wound up enslaved on a plantation. He would be a slave for more than 50 years and endured many whippings. He managed to escape to Philadelphia in the 1850's (when he was in his 80's). John went blind around the time that he turned 100. When Mary moved into the Home, she immediately hit it off with John and they became the best of friends. Mary looked after him and fed him his meals. They would sit and talk while Mary did sewing (she was an expert rag rug maker and in 1891, her work was displayed at an exhibition in Wilmington). John and Mary were featured together in several newspaper articles as the oldest people in America. Everyone at the Home called John "Father" and they called Mary "Mother". John died on February 20, 1895 at the age of 120. 1) Smoke after each meal and before bed. Never smoke before breakfast or on an empty stomach (Mary had smoked a clay pipe since she was 12). She said that her pipe was "a staff and comfort" to her. She went on to say "I have found tobacco eases pain, helps the digestion of food, cures insomnia and lightens sorrow". 2) Marry young. "Early marriage is good....it will keep men out of bad habits and bad company, will make them temperate and cause them to be punctual and industrious...this will keep women happy." 3) Get 8 hours of sleep every night (by this time, she was sleeping as much as 22 hours a day and would only wake up to eat and smoke). 4) Drink as little alcohol as possible. "Young folks should not drink at all if they would like to live long. When one gets to be 50 or 60, a small drink of whisky now and then does good, seems to build up the system like bread and milk....but in the young, whisky and beer only do harm." 5) Never take cold baths (she did not elaborate further). 6) Keep your mind occupied with work during the day. 7) Don't work at night. On November 14, 1905, Mary turned 135 years old. The Harrisburg Patriot ran a story about her with the headline "Forgotten By Death". The Grim Reaper wouldn't forget her for much longer. On December 23, 1905, Mary injured herself in a bad fall. She stopped smoking her beloved pipe on January 3 and died of exhaustion on January 5, 1906. She was buried at Olive Cemetery which was located directly behind the Home. In 1923 her remains were moved to Eden Cemetery where she rests near Octavius Catto and Marian Anderson. The Guinness Book of World Records lists Jeanne Calment of France (who died at age 122 in 1997) as holding the world lifespan record. They discount Mary (who died at age 135 years, 1 month, 3 weeks and 1 day) because there is no documentation of her birth. Although it can't be proven, Mary McDonald was very possibly the oldest person to have lived this side of the Old Testament.